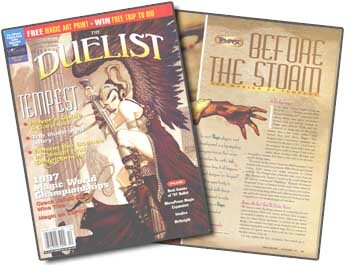 “Before the Storm” a Mark Rosewater article that originally appeared in the Duelist, discussed the design of Tempest. “Sliver Me Timbers” was Mark's article this past Monday, and it went into the Tempest-era Slivers in more depth. “One Part Ophidian, One Part Sliver” by Randy Buehler talks about Synapse Sliver, and how card-drawing creatures have bounced between blue and green. “Tales from the Crypt Sliver”, also by Randy, gives a card-by-card rundown of each of the Legions Slivers. “Designing Legends”, another Buehler number, talks about Sliver Overlord's creation in detail. If I was a man of questionable integrity, like, say, Randy Buehler, I would take this opportunity to ignore the theme week, and instead discuss something completely arbitrary, like Magic Online. But, lo, I am not Randy Buehler, and I refuse to torment this site's current editorial staff in the same way that Mr. Buehler so often tormented me with his flippancy concerning my carefully chosen themes. Why do you torture me Randy Buehler of 12 Maple Lane?! Ahem. Besides, what could I say about Magic Online that Dan Myers hasn't already told us in his hourly streaming updates? So I will be talking Slivers here, ladies and gentlemen. “Mistform Ultimus,” he responded—immediately and without any hint of emotion. Drat! Was he that smart, or am I that predictable? Livid at my own transparency, I beat Mark about the head and shoulders with a dowel rod normally reserved for determining line of sight in Dungeons & Dragons Miniatures, and then turned back to my computer to write. Mistform Ultimus was submitted to Legions development late in the process as a replacement for another card that didn't work out. CARDNAME has every creature type except Wall. Once the card was in the file, R&D was abuzz with discussions about the ramifications of what the ability actually meant. MR (5/9/02): Prefer this to have all creature types and have the line “CARDNAME may attack as though it were not a wall”. I just thinking having a creature be every creature type is cooler than being every type but one. Also, I think it might be fun to put an asterisk after the legend or some indicator that it has other types. Often in R&D we try to make cards as “clean” as possible, meaning we try to convey the essence of the card with as simply and with as few words as possible. In the case of the Ultimus, that would mean putting “except Wall” and not adding a new line saying that the Ultimus can attack as though it were not a Wall. As you can see, the shortest and cleanest versions don't always win. Sometimes “coolness” trumps cleanliness. I agree with Mark; the fact that the Ultimus is everything, Walls included, does have a certain elegance to it, even if it means more words on the card. The Ultimus may wish to reconsider his Wall-ness, however, when he wants to block an oncoming Juggernaut. That means the Ultimus is every type no matter where it is, and even if it loses its other abilities due to effects like Humility. Of course, the templating team didn't expect players to get that intuitively, so they added the reminder text “(even if this card isn't in play)”. So, yes, you can fetch him up with Sliver Overlord. ME 5/7 much more interesting as a small 1/1 creature than as a 4/4 for 6. Mike's contention was that, as a 4/4 for 6, the card was too clunky to be playable. Most “tribal” decks were inherently weenie decks full of small creatures, and if the Ultimus was too unwieldy, no one would ever put him in decks. The development team changed him to a “blue Ogre,” meaning a 2U 2/2, and then later upped him to his final stats of 3U 3/3. At that cost and size, he is cheap enough to be playable, yet big enough to tempt certain tribes into trying him out. Face it, 3/3 for four mana is a decent deal in a casual Merfolk deck, and he's no slouch as a Sliver either. MG 5/30: Can we put Illusion on the type line as well, purely for flavor? Most of you know Gottlieb as a demented deckbuilder that needs to be smacked with a dowel rod every now and again, but he's actually contributed quite a bit to the game of Magic through his excellent names and flavor text. (Perhaps he should take over those roles on Duel Masters as well. That game has vanilla 2/2's with names like “Blood-Skull Francona, Death Governor.” Weird.) Anyway, Mark has his fingers firmly on the pulse of the flavor of Magic, and his suggestion was a sound one. Besides, weren't all the other Mistform creatures Illusions? Other developers and designers had suggested “Creature – ? ?”, “Creature – Clone”, “Creature - *”, and just “Creature” with no subtype at all, but the team took Mark up on his suggestion, adding “Illusion” to the “Legend” that editing had already mandated. There was some debate on putting an asterisk at the end, but that was voted down. Because the list of creature types in Magic constantly changes, the Ultimus gains (and loses) creature types quite regularly. For instance, editing recently decided that "Rooster" should not be supported as a type since it is merely a gender change from the "Chicken" type. Important stuff! That means that the Ultimus was a Rooster last year, but isn't any more. The coolest change the Ultimus underwent, in my opinion, occurred when Mirrodin was printed. At that time, the Ultimus acquired a few new types, including Slith, Rogue, and Myr. But the biggest deal was the addition of the type "Human." That sounds like a funny short story to me: "The Day Mistform Ultimus Became Human." If anyone has free time and wants to take a shot at writing a humorous tale with that title, send it to me at latestdevelopments@wizards.com. I'll put the best ones up in a future column. Keep them short – anything more than a few paragraphs is probably overkill. For kicks, here's the full list of the Ultimus's current types, taken from the Comprehensive Rules. Abomination, Aboroth, Advisor, Aladdin, Albatross, Alchemist, Ali-Baba, Ali-from-Cairo, Alligator, Ambush-Party, Ancestor, Angel, Ant, Antelope, Ape, Archaeologist, Archer, Artificer, Asp, Assassin, Assembly-Worker, Atog, Aurochs, Avatar, Avenger, Avizoa, Badger, Ball-Lightning, Bandit, Banshee, Barbarian, Barishi, Basilisk, Bat, Bear, Beast, Bee, Beeble, Behemoth, Being, Berserker, Bird, Blinkmoth, Boar, Bodyguard, Brood, Brother, Brownie, Brushwagg, Bull, Bureaucrat, Butterfly, Camarid, Camel, Caravan, Caribou, Carnivore, Carriage, Carrier, Cat, Cavalry, Cave-People, Centaur, Cephalid, Cheetah, Chicken, Chimera, Citizen, Clamfolk, Cleric, Clone, Cobra, Cockatrice, Constable, Cow, Crab, Crocodile, Crusader, Dandan, Demon, Dervish, Deserter, Devil, Devouring-Deep, Dinosaur, Djinn, Dog, Doppelganger, Dragon, Dragonfly, Drake, Drill-Sergeant, Drone, Druid, Dryad, Dwarf, Eater, Eel, Effigy, Efreet, Egg, Elder, Elemental, Elephant, Elf, El-Hajjaj, Enchantress, Entity, Erne, Essence, Exorcist, Faerie, Fallen, Farmer, Ferret, Fiend, Fish, Flagbearer, Flying-Men, Force, Fox, Frog, Frostbeast, Fungus, Fungusaur, Gaea's-Avenger, Gaea's-Liege, Gargoyle, Gatekeeper, General, Ghost, Ghoul, Giant, Gnome, Goat, Goblin, Golem, Gorgon, Graveborn, Gremlin, Griffin, Guardian, Gus, Gypsy, Hag, Harlequin, Hell's-Caretaker, Heretic, Hero, Hipparion, Hippo, Homarid, Hornet, Horror, Horse, Horseman, Hound, Human, Hunter, Hydra, Hyena, Illusion, Imp, Incarnation, Infernal-Denizen, Inquisitor, Insect, Island-Fish, Jackal, Jellyfish, Kavu, Keeper, Kelp, King, Kithkin, Knight, Kobold, Kraken, Lady-of-Proper-Etiquette, Leech, Legend, Legionnaire, Lemure, Leper, Leviathan, Lhurgoyf, Lichenthrope, Licid, Lion, Lizard, Lord, Lurker, Lycanthrope, Mage, Maggot, Maiden, Mammoth, Manticore, Mantis, Marid, Martyr, Master, Medusa, Meerkat, Mercenary, Merchant, Merfolk, Mindsucker, Minion, Minor, Minotaur, Miracle-Worker, Mist, Mistfolk, Mob, Mold-Demon, Monger, Mongoose, Monkey, Monster, Mosquito, Mummy, Murk-Dwellers, Mutant, Myr, Mystic, Nameless-Race, Narwhal, Necrosavant, Nekrataal, Niall-Silvain, Nightmare, Nightstalker, Noble, Nomad, Octopus, Ogre, Ooze, Orb, Orc, Orgg, Ouphe, Ox, Oyster, Paladin, Peacekeeper, Pegasus, Pentavite, People-of-the-Woods, Pest, Phantasm, Phelddagrif, Phoenix, Pig, Pikemen, Pirate, Pixie-Queen, Plant, Poison-Snake, Poltergeist, Pony, Preacher, Priest, Prism, Pyknite, Rabbit, Raider, Ranger, Rat, Rebel, Reflection, Rhino, Robber, Roc, Rock-Sled, Rogue, Rukh, Sage, Salamander, Sand, Saproling, Satyr, Scavenger, Scorpion, Scout, Serf, Serpent, Shade, Shaman, Shapeshifter, Shark, Sheep, Ship, Shyft, Sindbad, Singing-Tree, Sister, Skeleton, Slith, Sliver, Slug, Smith, Snake, Soldier, Sorceress, Spawn, Speaker, Specter, Spellshaper, Sphinx, Spider, Spike, Spirit, Sponge, Sprite, Spuzzem, Spy, Squire, Squirrel, Stangg-Twin, Starfish, Stone, Strider, Survivor, Swarm, Tactician, Tarpan, Taskmaster, Tetravite, Thief, The-Biggest-Baddest-Nastiest-Scariest-Creature-You'll-Ever-See, Thopter, Thrull, Thundermare, Tiger, Titan, Toad, Tombspawn, Tortoise, Townsfolk, Tracker, Treefolk, Troll, Turtle, Twin, Uncle-Istvan, Undead, Unicorn, Vampire, Vedalken, Viashino, Villain, Viper, Volver, Vulture, Walking-Dead, Wall, War-Rider, Warrior, Warthog, Wasp, Wave, Whale, Whippoorwill, Wight, Wiitigo, Wildebeest, Will-o'-the-Wisp, Wirefly, Witch, Wizard, Wolf, Wolverine, Wolverine-Pack, Wolves-of-the-Hunt, Wombat, Wood, Worm, Wraith, Wretched, Wurm, Yeti, Zombie. Do you enjoy reading about the development of cards? Great! I'll mix it up from time to time, but until I've been here a while and acquired lots of dirty secrets, I'll be sticking to what I know. Aaron may be reached at latestdevelopments@wizards.com.